This recipe for a kefir raw cacao and goji berry smoothie is super quick and easy to prepare when you’re in a hurry. 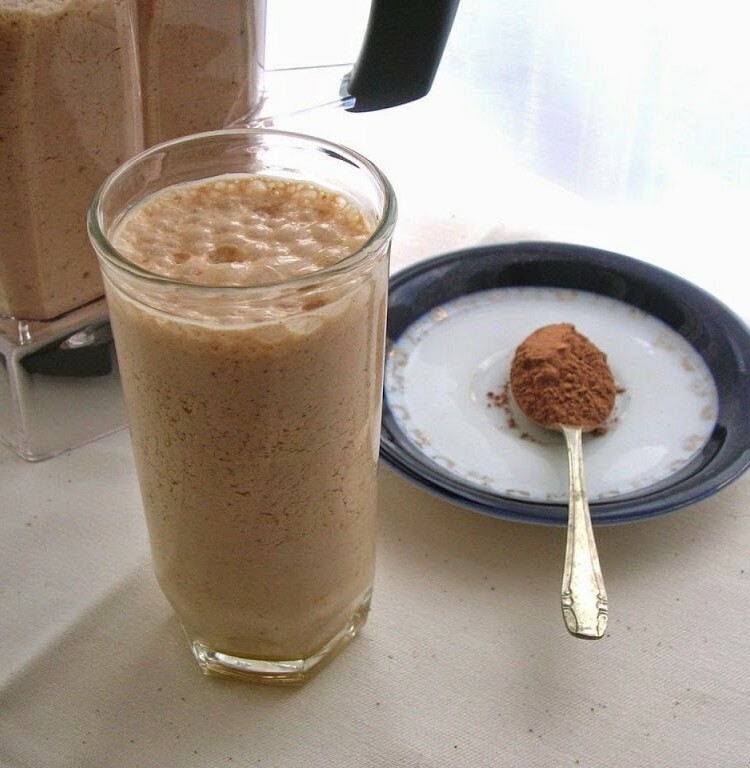 It produces a delicious creamy and chocolatey breakfast drink that will keep you going for hours. It’s also good for whenever you’re in need of a power boost. Biscuit recipes are my new obsession, especially easy biscuit recipes. I’ve always liked biscuits of course, but when it comes to baking, cake has always taken precedence over biscuits and cookies. I suspect being given Biscuit by Miranda Gore Browne as a birthday present last year has something to do with it. A whole book dedicated to biscuits puts a different spin on things. It stayed at the top of my pile of bedside reading for a long time. Despite this, I’ve only made one recipe from the book: blackcurrant and white chocolate biscuits – until now that is. We were off to spend the afternoon with friends and biscuits being quick and portable were an ideal bake to take along. To fit in with my supposed Healthy January, I went to Miranda’s Almost Healthy Biscuits section of the book for inspiration. 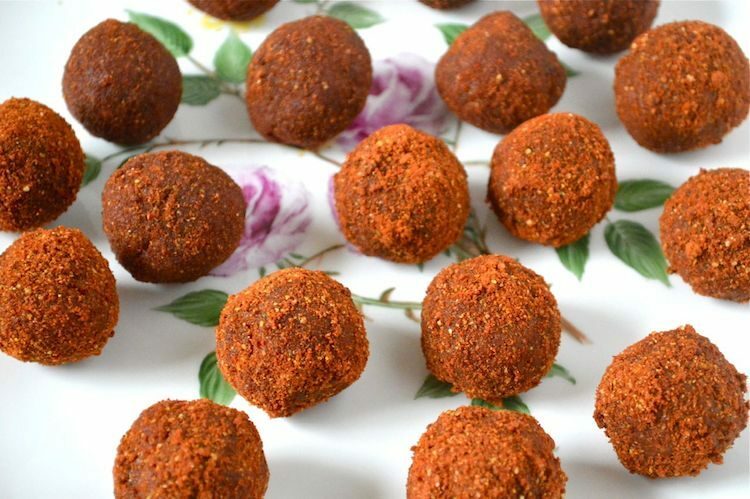 I got no further than the very first recipe, Super Berry Heroes – excellent, some healthy goji berries and blueberries to give a much needed nutrient boost would be my berries of choice. Not only did these contain an interesting flour mix of spelt and rye, but also included cocoa. I was recently sent a jolly red pot of Food Thoughts fairtrade, organic cocoa powder to try out and I was very keen to do so. Green & Black’s being fairtrade and organic is my go to cocoa, but it’s always nice to have some choice. As soon as I saw the organic status was certified by the Soil Association, I felt reassured as they and Demeter are the only certifying bodies I really trust. Fairtrade is really the only way to go – cocoa is a luxury and the people that grow it should be properly recompensed for their efforts. This cocoa comes from the Dominican Republic. I thought it would be fun to do a taste test with the three cocoas I happened to have in the house: Food Thoughts, Green & Blacks and Bournville. As well as the obvious colour differences, they were all quite distinctive in taste. Bournville is a very pale powder with a sweetish taste, but is rather insipid and lacks character. Green & Black’s is very dark, robust and bitter. Food Thoughts is midway between the other two in terms of colour but has a richer chocolate taste than either. However, in terms of packaging, Bournville gets the brownie points. The Bournville pot is about 3/4 of the size of the Food Thoughts one and yet they both contain 125g – when waste is such a big issue for us, over packaging is unnecessary and undesirable. We are a household of regular cocoa drinkers, but make it with no sugar, mostly water and just a dash of milk. I was interested to compare this with our usual Green & Blacks. In addition to the colour difference, we immediately noticed it had a more refined taste. It was smoother and less bitter and we really liked it. Creamed 120g salted butter with 100g vanilla (golden caster) sugar and 85g muscovado sugar until soft and pale. Beat in 1/2 tsp vanilla extract and one duck egg. Sieved in 60g wholemeal spelt flour and 80g rye flour, together with 1/2 tsp bicarbonate of soda, 1/4 tsp baking powder and 1 tbsp cocoa powder (Food Thoughts). Grated in 1/8 tsp nutmeg and mixed together. Stirred in 40g goji berries and 50g dried wild blueberries. Rolled teaspoonfuls of mixture between my hands to make about 30 walnut sized balls. Placed well apart on lined baking trays and baked at 180C for 13 minutes. Left to cool for a couple of minutes, then transferred to a wire rack to cool completely. In CT’s expert opinion, these biscuits were “rather good”. Crisp on the outside, soft and chewy on the inside with lots of texture. The cocoa added to the general flavour without being obviously chocolatey, which was absolutely fine. The spicy nutmeg flavour permeates the whole biscuit in a rather delightful way. Although there was no ginger present, they reminded us both of gingerbread in its best form. Dates are something I have a long association with, not just at Christmas. I grew up on date and banana sandwiches and I scoffed a fair few fresh ones during my various stays in Egypt. Fresh dates are something else all together, but as these are very hard to come by in the UK, Medjool dates are the next best thing and are in fact known as the “Fruit of Kings”. If you haven’t tried these before, they are big, plump, soft, fleshy and very sweet with a rich honeyed caramel flavour and make an excellent sweet treat all on their own. I was sent a beautiful gold box of twenty Medjool dates to try before Christmas. Apart from eating some of them just as they were, I had plans to stuff them with homemade marzipan and dip them in chocolate. Sadly, time ran out as time does and these plans didn’t materialise. Post Christmas, I’m keen to have something healthier, but I still want to make use of them as an ingredient. Ros chose V for Alpha Bakes this month, oh my goodness! Other than Vanilla and Victoria sandwich, I wasn’t having many ideas and although vanilla is fantastic, it’s such a common ingredient in cakes, I wanted something a little different. I’ve seen Viennese whirls popping up all over the place which is a great idea, but again not quite what I was looking for. So I turned to trusty Pam Corbin in her wonderful book Cakes and there it was at the bottom of the V list, Vinegar Cake. 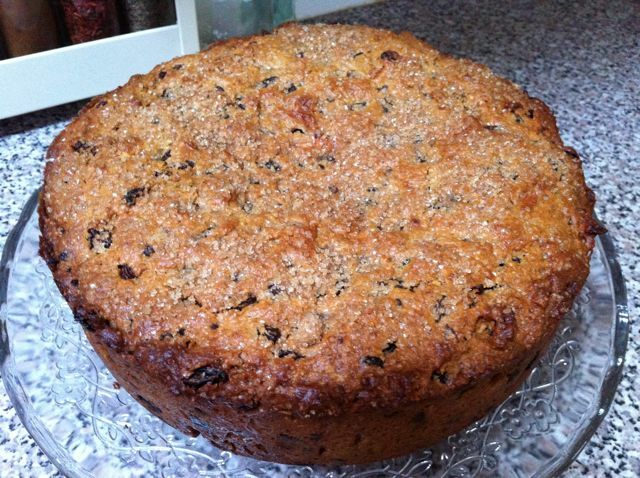 Traditionally made when hens were off lay, this is an eggless fruit cake from East Anglia. I added a few ingredients not mentioned in Pam’s recipe. Placed 1 tbsp mesquite powder and 1 tbsp maca powder onto the scales than added white flour to make the weight up to 250g. Sifted into a bowl along with 250g wholemeal flour and a pinch of salt. Rubbed in 200g unsalted butter cut into bits, until the mixture resembled breadcrumbs. Stirred in 500g dried fruit made up of sultanas, raisins, chopped dried apples, goji berries and crystallised orange peel (homemade). Stirred in 50g chopped Maya Gold chocolate (G&B dark orange spiced). Poured 300ml milk into a large bowl (didn’t have a jug big enough) and added 50ml cider vinegar. Stirred 1 tsp bicarbonate of soda into 1 tbsp milk. Added this to the milk and watched in amazement as it frothed up and up and up! Poured this onto the dry ingredients together with 2 tbsp golden syrup and mixed until just incorporated. Spooned into a 23cm cake mould and smoothed the top. Sprinkled 1 tbsp demerara sugar over the top and baked at 170C for 50 minutes. Left to cool in mould for 20 minutes then turned out onto a wire rack to cool almost completely – couldn’t wait any longer! Watching the milk and vinegar mixture whoosh up when the bicarb was added was impressive. It reminded me of one those school science lessons which probably no longer occur due to health and safety reasons. Whatever the underlying chemistry of it all, it seemed to work: the cake rose really well. Unfortunately, I took it out a little too soon, so it sank in the middle. Surprisingly, the taste of vinegar was noticeable by its absence. It had a lovely crunchy top and would have been great served warm with clotted cream or ice-cream. I’m not a fan of heavy fruit cakes, but this was just about right, plenty of fruit but plenty of cake too. CT is also not a fan of heavy fruitcakes, which he associates with being dense, dry &amp and desiccated with bucket loads of horrible mixed peel. This one, he opined, was pleasantly fruity with an unexpected sort of spritliness about it. It had a nice soft crumb and tasted slightly malty which I put down to the mesquite I added. We both felt thoroughly virtuous eating this because of the healthful properties of the maca I had included. Alpha Bakes is a monthly blogging challenge where a random letter is picked from the alphabet which then inspires the theme of the bake. It’s hosted alternately by Ros of The More Than Occasional Baker and Caroline Makes. Back in January when I saw the We Should Cocoa entry from Carol Anne’s Kitchen for chocolate and coconut granola, I bookmarked it straight away. As usual with these things it has sat neglected in my bookmarks folder along with many much older items. The spur I needed came in the form of this month’s Breakfast Club, founded and hosted by Helen of Fuss Free Flavours. The theme is Fairtrade. Now I know fairtrade is not all about chocolate, but chocolate was one of the very first things to be given the fairtrade label and it is this wonderful substance I associate most with Fairtrade. So time to trawl through my bookmarks where I was very sure I had a chocolate granola recipe! As is my wont, I adapted the recipe quite considerably. First off, I had bought a bar of Divine’s fairtrade 85% dark chocolate specifically for the purpose of this challenge. When I read the recipe however, it was cocoa that was used. Well blow that, mine was going to contain a bar of real live chocolate. As this was for breakfast I wanted something healthy – to me healthy means NO SUGAR. So instead of using sugar, I used a mixture of date syrup, agave syrup and honey. OK I know chocolate has sugar in, but there is very little in an 85% bar, so I let that one go. Put 250g of rolled oats into a bowl. Added 30g sesame seeds, 20g sunflower seeds, 60g apricot kernels, 30g goji berries, 50g coconut chips, 1 tsp ground cinnamon and 1/4 tsp fleur de sel (sea salt). In a pan warmed 40ml date syrup, 40ml agave syrup, 1 flat tbsp honey and 50ml walnut infused rapeseed oil. Added 50g of 85% dark chocolate (Divine) and stirred until melted. Poured this into the bowl of dry ingredients and mixed until everything was evenly coated. Spread this onto a large baking tray and baked for 50 mins at 125C, turning the mixture a couple of times during the process. Stirred in 50g of chopped 85% dark chocolate (Divine). What I wanted to achieve here was to add the chocolate at a point where it would melt a little and clump with the granola mixture, but not so much that it melted completely. I didn’t manage it, so the chocolate remained unmelded. The aroma of chocolate, coconut and roasting seeds emanating from the kitchen whilst this was cooking was mouthwatering and it scented the whole house wonderfully. Of course, I couldn’t wait until breakfast the next day to try some, so out came a bowl, spoon and milk and in went the granola. It was delicious and not too sweet; crunchy with the kind of texture which encouraged you to chew and enjoy the diverse flavours. I don’t think it will last long. 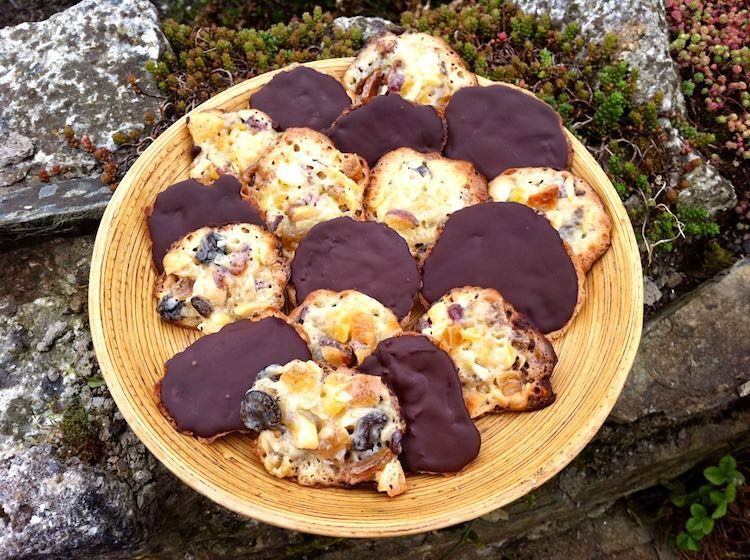 This recipe is the Tin and Thyme version of Nigella’s Florentines. 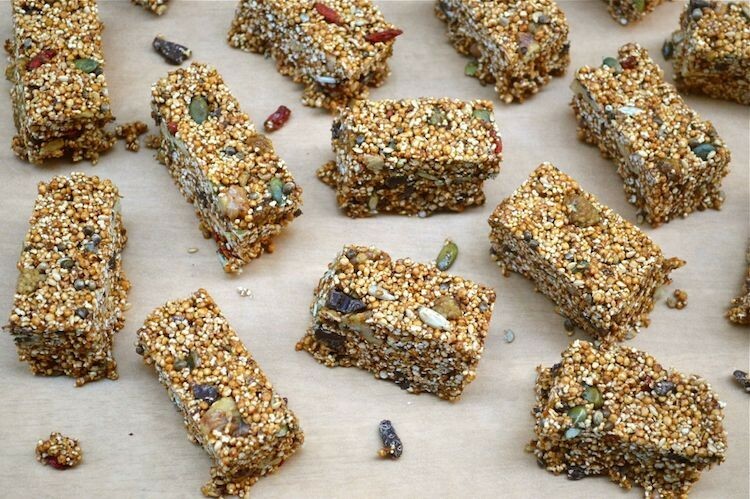 They’re easy to make, if a bit messy and they are nutty, chewy and delicious to eat. The dark chocolate creates the perfect foil for the sweet biscuits. They make great gifts for family and friends at any time of the year, but particularly at Christmas. I may not have managed to do much in the way of Christmas baking this year, but I did get to make a rather rich and fruity version of a “no bake cake” today. We may not have mince pies to offer the good folk who drop in to alleviate some of CTs boredom as he continues to languish on the sofa, but I do now have an alternative Christmas offering! Melted 200g Maya Gold (dark orange spiced chocolate) with 4oz unsalted butter and 4 tbsp double cream. In a large bowl, broke up 8oz digestive biscuits into small pieces (but not crumbs) with the end of a rolling pin. Added 4oz walnut pieces (again not too small), 2oz goji berries, 2oz crystallised ginger – chopped and 2oz dried figs – chopped. Mixed in chocolate mixture until all thoroughly combined, but taking care not to break up the biscuits and other pieces too much. Turned out into a 9″ sq cake thingy and left in the cold for a couple of hours. Normally, one would expect this to go into the fridge to set, but our kitchen is so cold, fridge was not needed. When set cut into 24 rectangular pieces. As well as being truly scrumptious, this is such a quick and simple thing to make. Lots of healthy fruit and walnuts and with no additional sugar, this was just the right side of sweet for our taste. Very rich and choclatey, this is definitely an adult version of a kids’ favourite and a little goes a long way. Not quite the sort of cakes I was planning on doing for Christmas, but the figs give it that festive flavour. And who knows what I might be able to squeeze in next weekend!